A bride is a heteronormative image that implies the participation of other characters in a marriage play. One can only be a bride if they are first a fiancee and in contrast to a partner (traditionally a groom). While the former label is genderless, save for assumption, queer images of fiancees still don't exist in the realm of marriage. This performance poses the title question in search of an answer that makes room for an alternative. 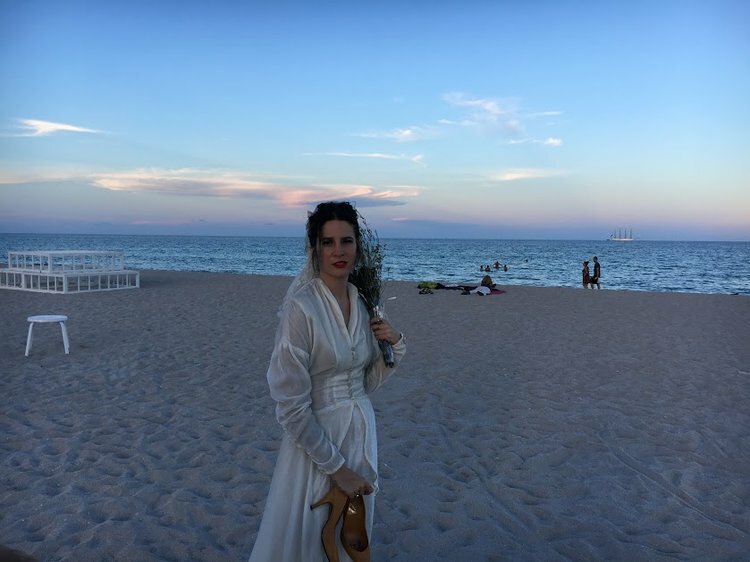 The Fiancee frantically roams a beach in search of their fiancee who has gone missing right before the wedding ceremony. There is no indication of gender in the Fiancee's speech or gesture. As well, they remain genderless. How can one assume the missing partner's costume or gender? The Fiancee also serves as a metaphor for the in-between stage of life for a female characterized by virginity and restrained by binary tradition. This type of woman lives only in anticipation of a wedding (ceremony of womanhood).